All recipes are enough for four people. The printable shopping list and recipe prompts link is underneath the Fishermans Pie recipe. 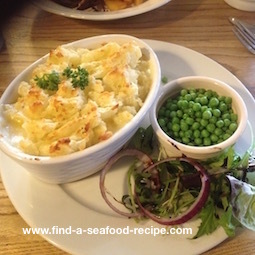 The Tuna Bake and the Fishermans Pie can both be prepared in advance, so you can heat them in the oven when you're ready to eat. Tuna Pasta Bake is a real family favourite. It's simple to make and you can prepare it ahead, just heating it up in the oven before you're ready to eat. The video above is one that I've done to show you the steps and talk you through them. I would serve some steamed or boiled broccoli with this to add an extra portion of veg - you could serve crusty fresh bread if your family have bigger appetites. Baked Salmon cooks in around 15 minutes in a hot oven. You need to have your sides nearly ready before it goes in to cook. Serve it with some herb buttered new potatoes, steamed carrots and green beans. A garlic mayonnaise or plain mayo would go well with it too. A portion of salmon will provide you with more than your required amount of Vitamin D for the day, some B6 and B12, Omega 3s, protein and minerals. This is your 'one oily' for the week. If you cook one or two extra pieces of salmon (around 6 to 8 ounces in total) you can pop it in the freezer and use it for salmon fish cakes or a pasta dish. 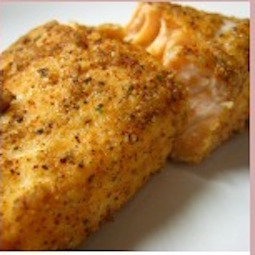 Next week, Salmon Fish Cakes is on the menu - you can use canned or leftovers. This Fishermans Pie is fabulous. A lovely mixed seafood in white sauce under fluffy mashed potato. Cook either in one big dish or divide between four individual dishes. If you like, you can add some defrosted shrimp to the mixture - most fish pie mixes will be white fish, smoked fish and salmon in chunks. You can buy it fresh or frozen. Your potato is already included, so serve this with green peas and a mixed leaf salad. If you make your fish mixture early and cool it then it will set in the bottom of the dish. This will make it easier to spread the potato mixture on top as the sauce will have thickened. It will go 'saucy' again when it's been re-heated in the oven.